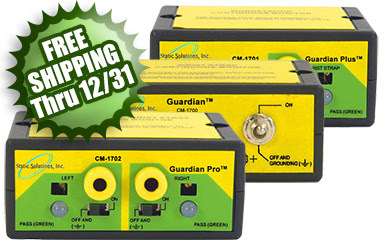 Running through the end of this year, our Static Solutions Free Shipping promo offers a great chance to save shipping costs on their Guardian ESD Constant Monitors. You’ll get free standard ground shipping on these select items with this QSource.com-exclusive special. Dimensions: 3" x 2.75" x 1"
Click the link to purchase your Static Solutions Guardian ESD Monitors at our special offer page, TODAY. You may also contact us via our Web site, phone (800-966-6020), or by email. Please note: This limited-time offer is only valid thru 12/31/16.